I had no idea I could be this excited about toilet paper, but I’ve been proven wrong! Trust me guys, you are going to be blown away. 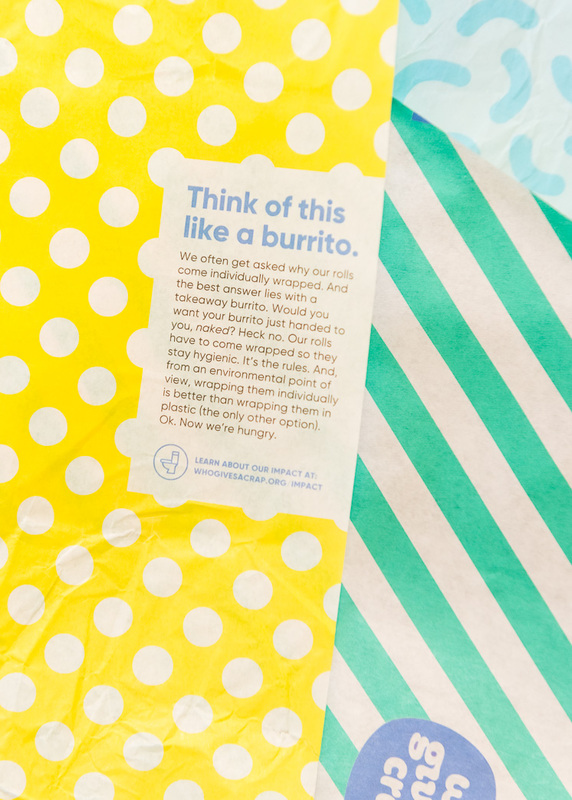 This toilet paper is the most adorable I’ve ever seen, exhibits hilarious and clever branding, and the mission behind the product is truly inspiring. 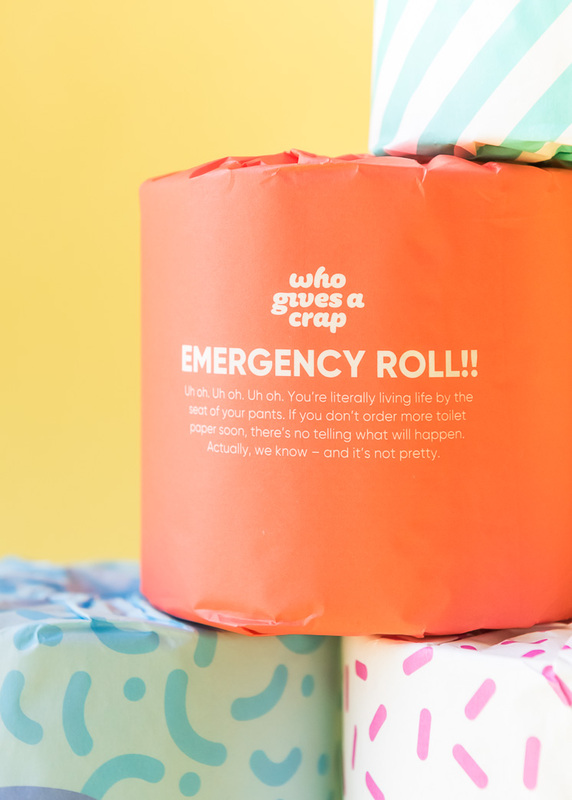 Who Gives A Crap (yes, that is the company’s genius name), is an amazing company creating toilet paper from 100% recycled materials. They donate 50% of their profits to help build toilets for the 2.3 billion people without access to one. Good for your bum, great for the world! 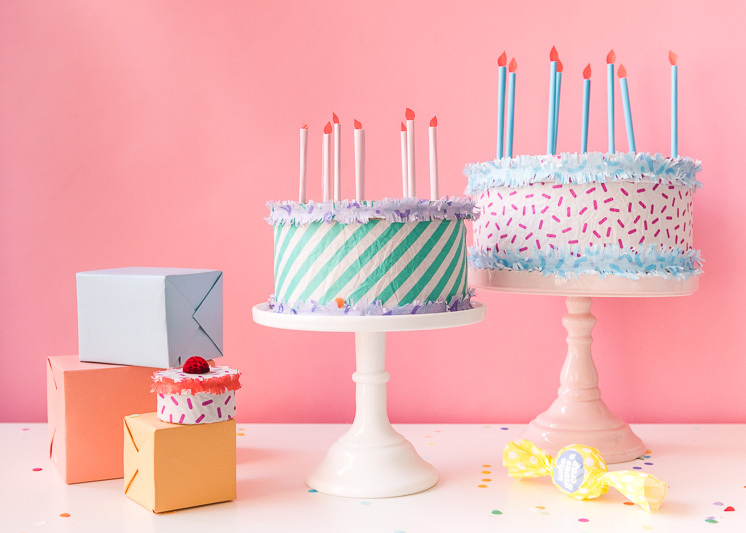 Take a closer look at these Dessert Gift Packages and learn more about Who Gives A Crap! 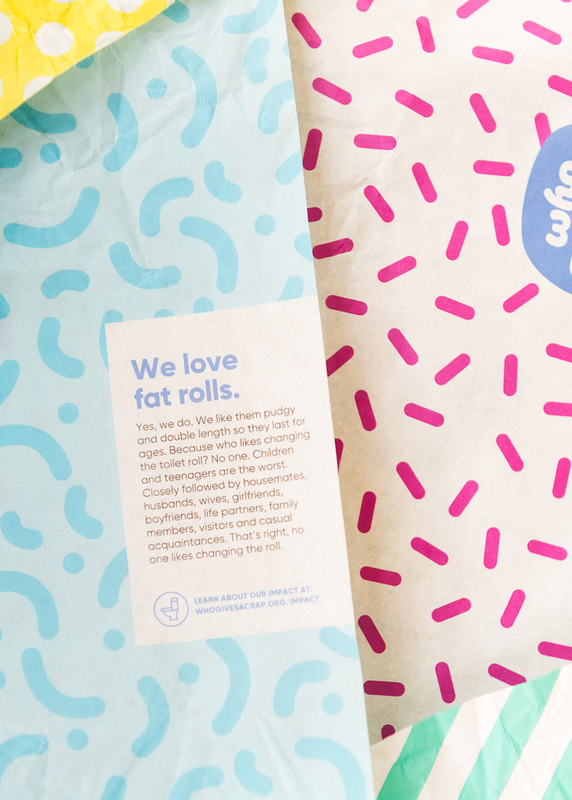 We ordered a box of 48 double length rolls for $48, which is a total steal considering it’s delivered straight to your door, saves trees, and gives back to the community. 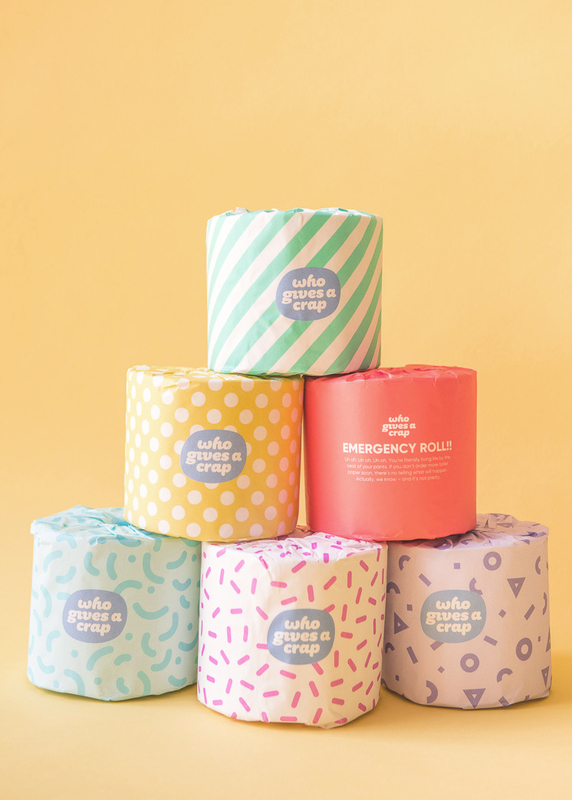 Each 3-ply jumbo roll is individually wrapped in the cutest packaging to eliminate the plastic covering usually necessary for sanitary reasons. I immediately fell in love with packaging and wanted to continue the ‘waste not’ mentality. We decided to reuse the packaging as gift-wrap since the patterns and colors are so fun! 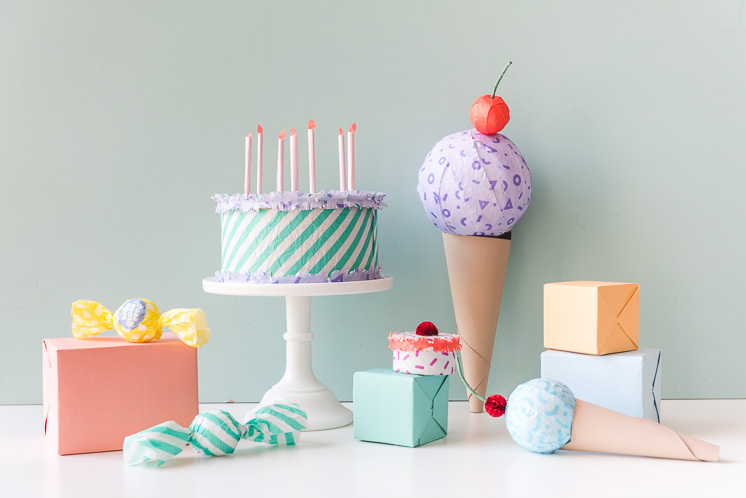 Regular gifts turn into cakes, ice cream cones, and bon bons, making the packaging just as exciting as the present within. 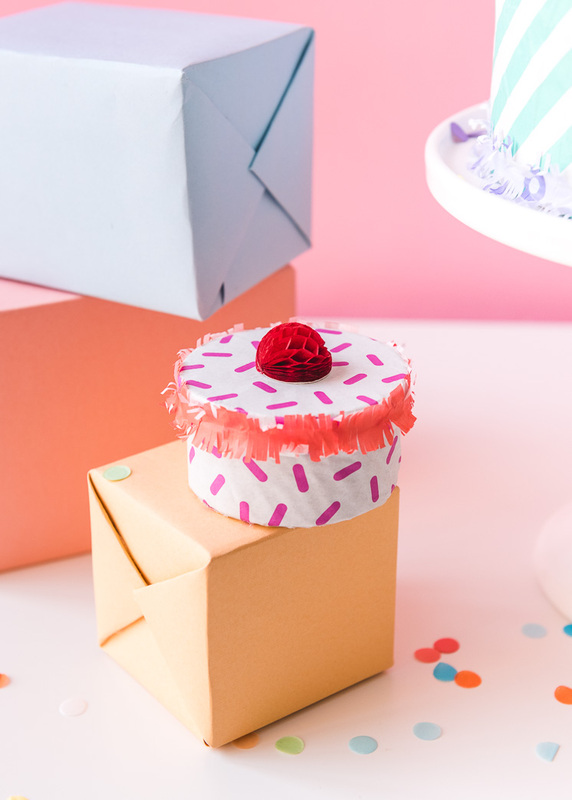 To create our dessert gift packages, we used hatboxes to create the cakes. 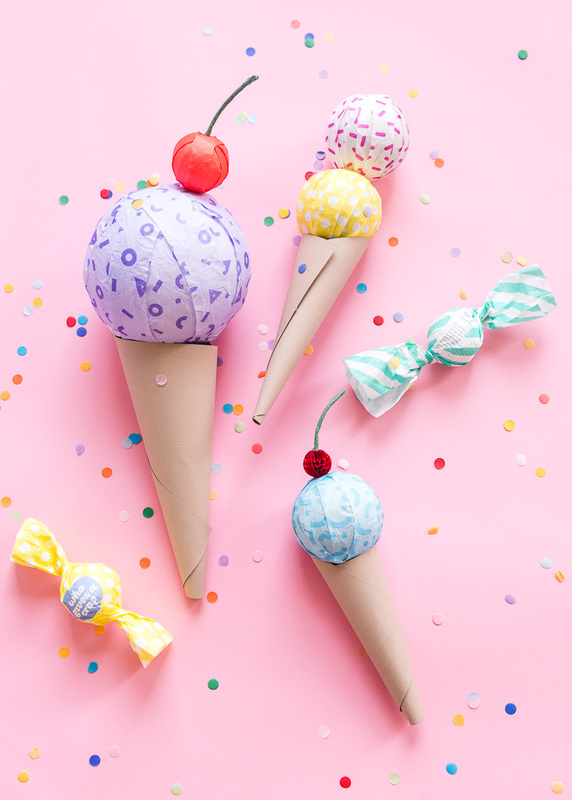 For the ice cream cones and bon bons, circular objects make are easiest to transform—Things like balls, bath bombs, or soft goods you can roll up. 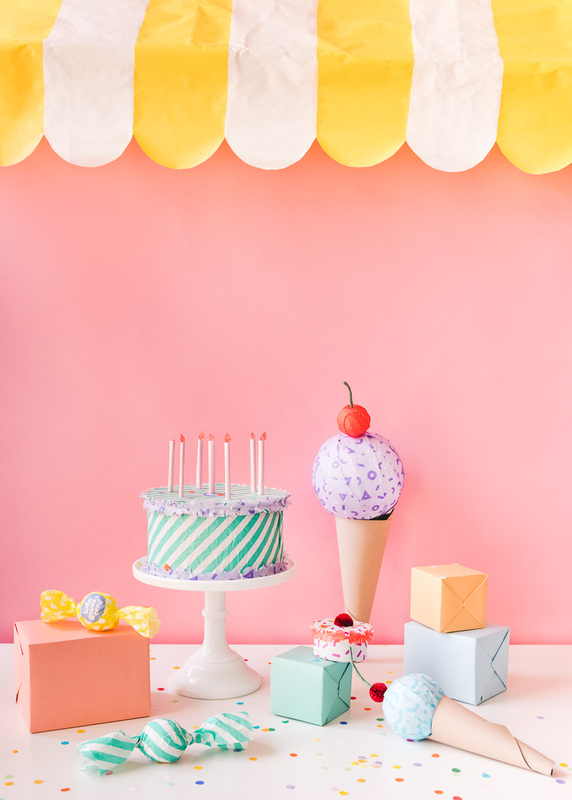 Or you can use the ice cream cones as favors, placing trinkets and candy into the cone and placing a styrofoam ball on top. When your toilet paper arrives from Who Gives a Crap, first read the box because it’s hilarious! Then unwrap your toilet paper rolls to remove the wrappers. Iron your wrappers to remove the large wrinkles and create a flat piece to work with. To cover the sides of the box, cut the paper to the width of the box and wrap around securing with hot glue. To cover the top, trace the lid onto the packaging and cut the circle out. Glue to the top of the box with hot glue. Then cut a thin strip, wide enough to cover the edge of the lid and glue onto the edge. 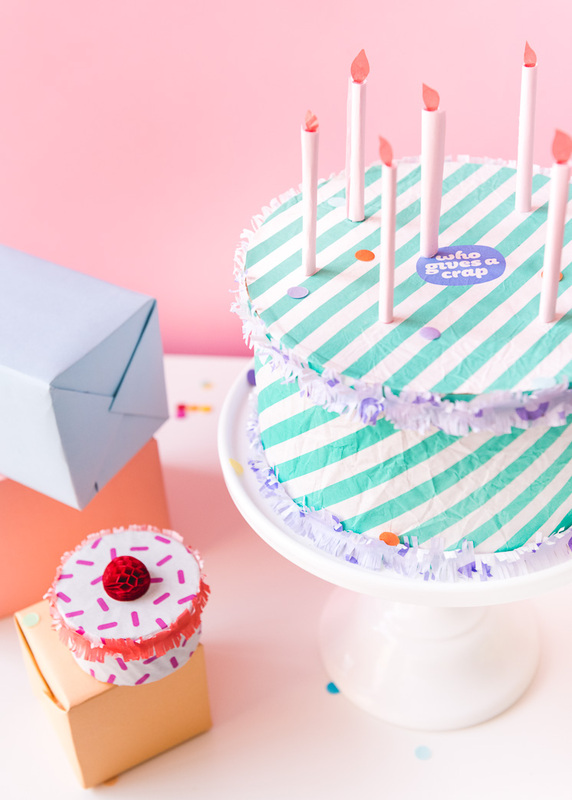 To create the ruffled ‘frosting’ on the edges, cut strips 1.5-2X larger than the edge, and fringe both edges of the strip, making sure not to cut through the strip. Glue along the lid edge and along the bottom edge of the box. 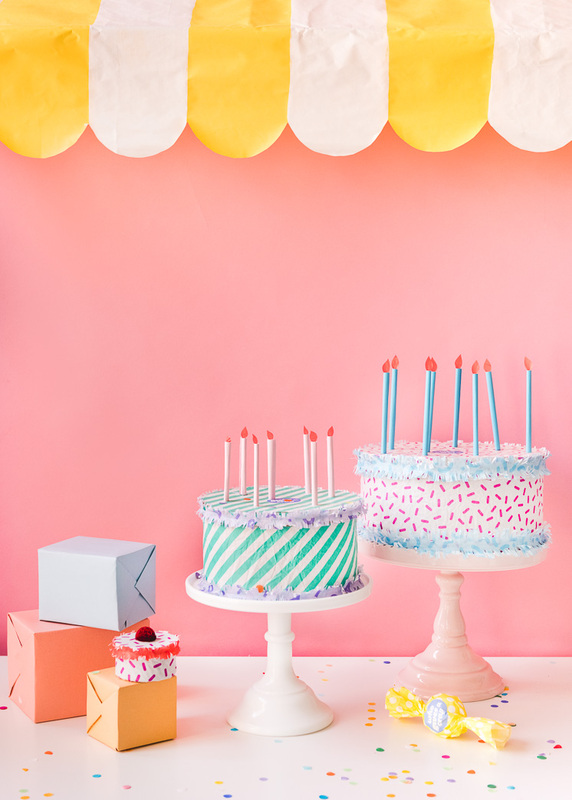 To create candles, take paper and cut pieces 1.5 inches wide and however tall you’d like your candles. Roll the piece up tightly and secure with hot glue. Cut a small flame shape out from the packaging and glue into the candle top. Take a piece of cardstock or regular paper to act at the cone. Start from the bottom corner of the paper and roll into a cone shape, trimming the paper if necessary, and securing with hot glue. Cut the packaging into .5-inch to 1.5-inch wide strips. Then wrap your “ice cream scoop” with the paper strips around the circle until it’s completely covered. Secure with glue or tape. Place the ice cream scoop onto the opening of the cone and secure with glue or tape. Cut a piece of packaging large enough to be wrapped completely around the item, extending 2 to 3 inches on either side. Wrap around the item and tape to secure. Gently twist the paper on either sides of the bon bon. Leave as is or tie with string to secure. So do yourself a favor and order a box of Who Gives A Crap Toilet paper! It’s something you are already going to buy, so you might as well give back to the environment and the community at the same time! Plus, you need the adorable packaging! Who Gives A Crap sponsored this post. We’re huge fans of the product and all opinions are genuine. Thanks for supporting these companies!